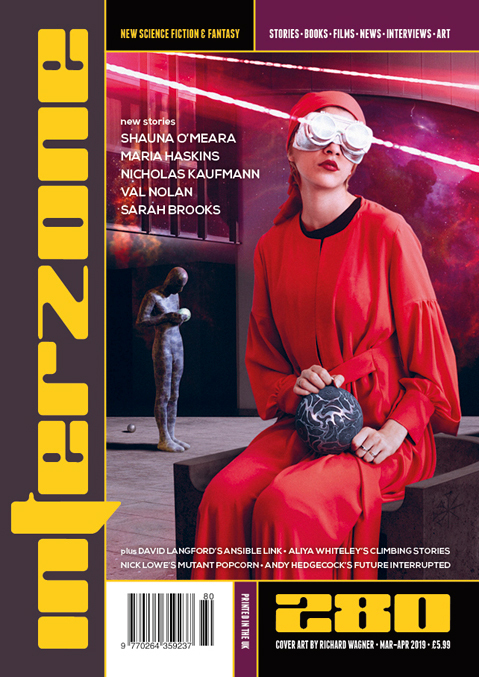 On the doormat this morning: Interzone 280. This one contains – among all the other goodies – my review of The Orphanage of Gods by Helena Coggan. My review of The City in the Middle of the Night by Charlie Jane Anders, due in issue 281, has been despatched. Titan Books, 2018, 407 p.
This is the first of this year’s BSFA Award nominees for best novel that I have read. Apart from the prologue, a somewhat ropily written account of the destruction of an entire ecosphere – an act which depending on point of view either brought the war between the Conglomeration and the Outward to a swift end, thus saving lives, or else was an unforgivable crime – this novel is told in first person chapters narrated from various viewpoints, three human, one spaceship AI and that of a peculiar alien creature with many legs whose feet act both as hands and faces and is the spaceship’s engineer/general dogsbody but nevertheless gets the last word, plus a single one-page chapter narrated by an ancient armada of spaceships. Captain Sal Konstanz was present at that planet destroying act of war but since then has been dedicated to the peaceful House of Reclamation, an organistion set up to rescue survivors from space disasters or acts of piracy. Ona Sudak is a poet with a secret, a passenger on the stricken ship Geest van Amsterdam, Anton Childe a Conglomeration agent gun-running on a backwater planet till his bosses tell him to find Sendak, Trouble Dog is Konstanz’s ship’s AI, once dedicated to war but whose conscience made it too join the House of Reclamation, Nod is the alien, much given to rumination and philosophising. OK, Embers of War is set in the aftermath of a war rather than its waging or genesis but I don’t see much to mark it out from the ordinary run of military SF/space opera. There must be better SF novels published in 2018 out there. You may have noticed on my sidebar that I’m currently reading The City in the Middle of the Night by Charlie Jane Anders. This is because it’s the latest book I’ve received for review in Interzone. Ms Anders is another author new to me. She is, though, a multiple award winner, gaining the Hugo for her novelette Six Months, Three Days in 2012 and several awards including the Nebula Award for her novel All the Birds in the Sky in 2017. The review ought to appear in Interzone 281. This book does what it says on the tin. 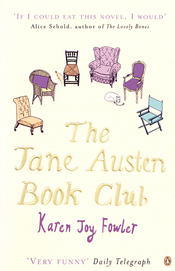 Six people are brought together by co-ordinator Jocelyn to read the novels of Jane Austen and meet – or not depending on circumstances (a hospitalisation for example) – to discuss them, one each per month. There are some parallels between the lives of the group’s members and incidents in Austen’s novels, Jocelyn’s attempts at match-making notable among them, but they are really just grace notes. In effect, what Fowler has done here is conceived a way to collect six short novellas – or six longish short stories – under the umbrella of a novel. Yes, there is some character development – Jocelyn’s initial dismissal of only male group member Grigg’s enthusiasm for Science Fiction (“She didn’t actually have to read science fiction to know what she thought of it. She’d seen Star Wars”) overcome by his introduction to her of the works of Ursula Le Guin being a case in point. The book is clearly targetted at readers familiar with Austen’s œuvre as there is frequent mention of incidents/dilemmas/characters from the books plus an update of her most famous aphorism in the form of “‘Everyone knows,’ Prudie said, ‘that a rich man is eventually going to want a new wife,’” but even those unfamiliar with the works will find it readable enough. I somehow doubt, though, that any aficionados will come away from this enthusing about it. It’s not a patch on We Are All Completely Beside Ourselves or even Sarah Canary. In her guest editorial Aliya Whiteley wonders who owns a story as influences can colour story telling as if by osmosis. Andy Hedgecock’s Future Interrupted notes a new approach to doorbell ringing by those under 25 in his consideration of the changes wrought by the internet and the false sense of agency fostered by advertisers and data brokers. Nina Allan’s last Time Pieces muses on what a difference four years can make, in politics, in Doctor Who, in the inclusiveness of SF as a whole. In Book Zonea Duncan Lawie welcomes the wide perspective in the anthology Twelve Tomorrows edited by Wade Roush, Ian Sales appreciates Hannu Rajaniemi’s latest novel Summerland despite its lack of SF bells and whistles but is slightly more critical of Liminal by Bee Lewis, I wax lyrical over Francesco Dimitri’s The Book of Hidden Things but less so with Supercute Futures by Martin Millar, John Howard approves of the anthology Infinity’s End edited by Jonathan Strahan, Andy Hedgecock describes Literature® by Guillermo Stitch as a promising debut and Julie C Day’s first collection Uncommon Miracles (can there be common miracles?) as not merely promising but astonishing while Stephen Theaker enjoyed Pasi Ilmari Jääskeläinen’s Secret Passages in a Hillside Town. Inscribed on Dark Waters by Gregor Hartmann has a student on a work experience programme on an ocean world at a factory producing liquid hydrocarbons biochemically being befriended by an inspector who has her own agenda. The student has an idea to improve the processing. The Sea-Maker of Diarmid Bay1 by Shauna O’Meara is another sea-based tale. Four boys on a fishing expedition on a global-warmed, polluted planet come across a mythical creature, a sea-maker. The narrator of Joanna Berry’s The Analogue of Empathy2 is a robot, a Cognitive Intelligence Personhood Emulating Robot to be precise. Doctor Harris is developing its – her – consciousness in an attempt to save humanity from itself. Since its structure, form and feel so closely resemble Daniel Keyes’s Flowers for Algernon I would be amazed if this story did not take its inspiration from that source. Territory: Blank3 by Aliya Whiteley is a journal based story but the entries are presented to us out of order. Narrator Saffron enters one of the domes; simulated environments designed as entertainment for the masses. Either she goes mad or the domes generate inimical entities by themselves. The third explanation – that Saffron is the experimental subject – is vitiated by the manner of her second dome excursion. Samantha Murray’s Singles’ Day4 – Singles’ Day is like Black Friday but only for the partnerless – is a multi-viewpoint tale of four winners of a Singles’ Day lottery (via Smile to Pay) for passage aboard a starship intended to travel through The Rift to the planet of Zorya to escape an overcrowded Earth. The story does not need the info-dump of its preamble. 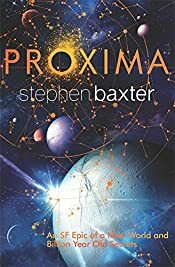 Proxima is set in the mid-twenty second century after the Heroic Generation has been demonised in retrospect. Yuri Eden was cryogenically stored by his parents till better times arrived. He wakes up on the Ad Astra, a starship bound for Proxima Centauri, one of many caught up in a sweep (press-ganged) to provide colonists for an Earth-like planet tide-locked to that system’s third sun. Meanwhile back in the solar system — where, on Mercury, mysterious artefacts known as kernels have been discovered and are proving a revolutionary power source — Stephanie Penelope Kalinski is forging her career as a physicist. Life on Proxima c, dubbed Per Ardua by the colonists, is harsh and brutal. Soon, out of his group of thirteen colonists, only Yuri and Mardina Jones, a ship’s officer of Australian aboriginal lineage, delegated/dragooned/abandoned by her commander to fill a gap in the manifest as the best genetically diverse replacement available, are left, along with an AI robot known as a ColU. Together they watch the local life forms – stick-like creatures they call builders – while trying to scratch a living from the surface. Despite mutual misgivings they have a daughter, whom they name Beth. Despite strict orders to remain where they were set down they have to migrate as their water source – a lake – is moved by the builders. Eventually, meeting other groups along the way they gravitate towards the point on the Per Ardua’s surface immediately below the sun. On Mercury a further apparently alien device is discovered under a hatch in the bedrock. When it’s opened Stephanie finds a twin, Penelope Dianne, previously unknown to her, and her name has become Stephanie Karen, but everyone else thinks this is how it has been all along. The hatch has altered reality, created ragged edges like Steph’s memories or her mother’s headstone where Steph’s original name remains inscribed. The hatch sequences were somewhat reminiscent of Arthur C Clarke’s The Sentinel (which provided the germ for 2001: A Space Odyssey.) The link between the two narratives is then established. This is all good, solid Science-Fictional stuff but the characters are not very engaging, limited in scope, mostly at the mercy of the plot, present only to push the story along. The cover makes it obvious (“Vatta’s Peace: Book 1” is inscribed below the title) that this is the first part of what I assume is a trilogy. What I hadn’t realised when I picked it up was that there is a previous trilogy (“Vatta’s War”) to which this is presumably a sequel of sorts. Not that it matters: Cold Welcome pretty much stands on its own with Moon slipping in information about Admiral Ky Vatta’s past as and when necessary. After apparently unexpected success as a war commander against unlikely odds Vatta is returning to her home planet, Slotter Key, where her family is a prominent presence. There is some early interplay about the wearing of spacesuits for a shuttle descent which makes it beyond obvious to the reader that skullduggery is afoot. And indeed the shuttle encounters trouble during the descent, its pilots and a local military commander being murdered by devices in their suits. Vatta and her aide-de-camp wore their own suits and so are spared, along with lesser luminaries on board. The shuttle comes down in a polar sea near an uninhabited continent which – conveniently or otherwise – has a reputation for mishaps and communications blackouts. As senior military officer Vatta takes charge even though she is not in the local command chain. Her expertise gets the survivors through a few days at sea in life-rafts and landfall on an inhospitable beach. From then on it all gets a bit Alistair MacLean with Vatta wondering whom she can trust and intrigues played against her. The continent also turns out not to be quite as abandoned and inhospitable as everyone supposed. Cold Welcome is reasonably standard SF fare with not a lot of consequence to it. Violence, though not entirely absent, is mostly off-stage here (for which relief much thanks; I’m getting fed up with SF where violence seems to be the only type of conflict resolution available) and the SF trappings are mostly off the shelf. We don’t find out though who exactly the conspirators were who committed the shuttle murders nor those behind the goings-on on the polar continent. No doubt all will be revealed in later books in the sequence. I may not bother with those though. Neither the scenario nor its execution piqued my interest enough.